My name is Lana Kang, and I am a consultant at the Go For Broke National Education Center. I graduated from Washington and Lee University with a B.A. in Japanese Language and Literature. In addition to consulting with GFBNEC, I work full time as the Director of Operations at Hopalong Animal Rescue, a non-profit rescue focusing on adopting out dogs and cats in the San Francisco Bay Area. This past December, I graduated with my M.S. in Library and Information Science from Syracuse University. Pursing my two passions of animal rescue and literacy/preservation at the same time has been both difficult and extremely rewarding! I started working for Go For Broke National Education Center in July as an archives intern through my library science program. I was ecstatic to find a hands-on experience that combined my interests of preservation with my studies of Japanese culture and language. My primary duties include indexing and cataloging the Hanashi Oral History Interviews and the Military Intelligence Service Veterans Club of Hawaii Interviews of Japanese-American World War II veterans. When I started indexing interviews, I recognized that the Japanese-American experience during World War II was difficult and fraught with challenges, but I was surprised by the extent and depth of those challenges. While their family and friends back home were corralled into incarceration camps, the Nisei soldiers bravely overcame racial discrimination, attacks on their loyalty and character, and overwhelming odds during their service to our country. It is a powerful and moving experience to be able to see the veteran’s faces and hear their first-hand accounts through these oral history interviews. I am honored to contribute to an organization that not only archives and records these important stories, but also educates others by the legacy of the Japanese-American soldiers during World War II. I am the project manager for the National Digital Archives of Japanese American Military Service (NDAJAMS) here at Go For Broke National Education Center (GFBNEC). My primary responsibilities are to design and implement the standards and processes to create meaningful information about the oral histories and special collections items in this digital initiative. For almost two decades GFBNEC volunteers and staff have worked diligently to record over 1,100 Nisei soldier oral history interviews. The Hanashi Project’s successes now allows us to create the NDAJAMS so that we can publish and disseminate the narratives of these soldiers in service of our organization’s mission– to educate the community of the rights, challenges and responsibilities of citizenship. Blog posts from me will be on the topic of project progress, lessons learned and highlights. Please check back soon and often! My name is Sean Stanley, and I am an intern at the Go For Broke National Education Center. I am a graduate of Cal Poly Pomona with a B.A. in History and will be starting my M.A. in Library and Information Studies in the spring. In addition to interning, I also work part time for Claremont Heritage, a local heritage organization in Claremont, CA that deals with digital archiving and preservation of historic items. History is a great passion of mine and in the short time I have been with the GFBNEC, I have already learned so much. I started interning at the GFBNEC in July of this year and I am currently working on indexing the Hanashi Oral History Interviews of Japanese American World War II veterans. The interviews are extremely enlightening and interesting; each veteran has a unique story that really brings to life what the World War II era was like for Japanese Americans. I often feel that this area of history is glossed over or not covered as it should be, which is really a disservice to all Japanese Americans who experienced a life of discrimination and struggle during World War II. In working with the oral histories, I have learned so much about our Nisei soldiers who served in the 442nd and 100th Infantry Battalions as well as the Military Intelligence Service throughout the Pacific Theater. These brave men sacrificed their lives for a country that did not always treat them justly, yet are proud veterans who served and protected their country valiantly. The Hanashi Oral Histories are an extremely important historic tool and I am grateful to be helping preserve these resources for future generations. It is my hope that this project allows others to gain easier access to these interviews and help preserve the legacy of the Nisei soldiers of World War II. My name is Alan Hino, and I am an Intern at the Go For Broke National Education Center. I am a graduate from CSULB as an English Education major with an emphasis in Literature. I will shortly begin working towards an M.S. in Instructional Design. I began working for the organization in July, and I am currently working on indexing the GFBNEC’s Hanashi Oral History Interviews of Japanese American World War II veterans. I became very interested in both the 442nd Regimental Combat Team, as well as my family history, when I found out my Uncle Hobi Fujiu volunteered for service in the 442nd as a part of the Anti-Tank Company. In addition, my Uncle Tom Shishido was drafted into service out of Manzanar with the Military Intelligence Service (MIS) and served under General MacArthur. I am extremely proud of my Uncles and their brave service to their country. I am so thankful for the opportunity to work on my Uncle Hobi’s Hanashi Oral History Interview video clips. My hope for working on such an amazing project as the Hanashi Oral History Interviews is to help educate future generations about the legacies of the 442nd / 100th Infantry Battalion / MIS. Finally, I am very appreciative for the opportunity to work on such an important project. My name is Chris Brusatte, and I am the Exhibit Manager at Go For Broke National Education Center. My primary job is working on our new interpretive exhibition, set to open next spring in Los Angeles’ historic Little Tokyo district. I also work on many of our social media initiatives, updating our Facebook, Twitter, and Flickr pages. I try to post fresh and interesting things as often as I can. Finally, I also work with our Vice President Barbara Watanabe on programs – i.e. community events such as lectures, panel discussions, and visits to area schools. It’s the way that we reach out directly to our stakeholders. I work closely with Summer and Erin (our Collections/Archival staff), since they are the source of all of the material that I use for all of these initiatives. When I need a great oral history clip, or a certain photograph, or perhaps a powerful document, I turn to Summer and Erin. It is their hard work that allows me to find (and to show) such valuable gems from our collection. Because of them, I am able to make our exhibition, our programs, and our social media updates rich and informative. Be sure to check them out! Stay tuned for more blog posts from me, mostly about the initiatives that I mentioned above. We at Go For Broke have such a valuable, diverse, and rich collection, and we are excited to share it with you through this blog! My name is Erin Sato, and I am the Assistant Archivist at Go For Broke National Education Center. I started working at GFBNEC in December 2014, as an intern, where I digitized photograph collections of Nisei (second-generation Japanese American) soldiers. I am currently working on indexing GFBNEC’s Hanashi Oral History Interviews of Japanese American World War II veterans, who served in the 442nd Regimental Combat Team, the 100th Infantry Battalion, and the Military Intelligence Service (MIS). We hope to have these oral history video clips available and easily accessible to researchers in the near future. My experience working with the GFBNEC Archives, so far, has been incredible! I have learned so much historical context about the Pacific and European Theaters of World War II through the military service of the Nisei soldiers. Those men risked everything to not only prove their loyalty as American citizens, but to ensure that the generations after them could have a better life. 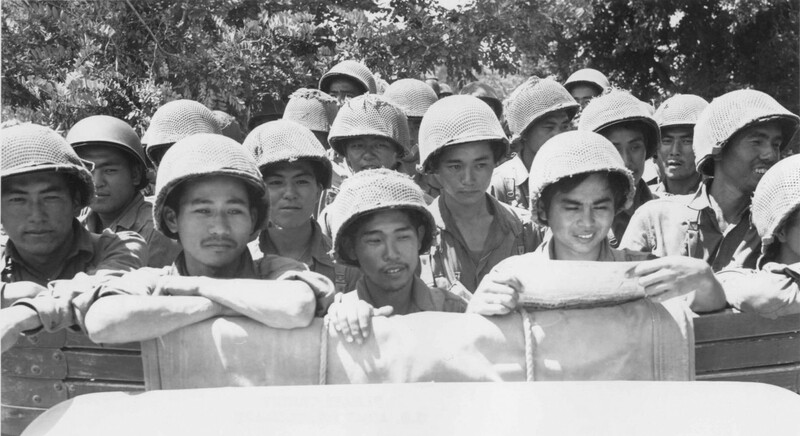 Through this blog, I hope to share more about the work being done within the GFBNEC Archives, as well as enlighten others about the legacy of the Nisei soldiers of the 442nd/100th/MIS.